Tired of Noisy Nights or Restless Mornings? Your home should be a respite from the hustle and bustle of the daily grind; a place you can find refuge from the demands of modern life and the constant aural and visual onslaught of the modern world. Things don’t always work out as planned though. Some people live next to trains, heavily trafficked roadways, barking dogs, early morning yard workers and loud neighbors. Although windows and doors aren’t the be-all and end-all answer for soundproofing your home, they can be a major contributor to a comprehensive noise-reduction solution. 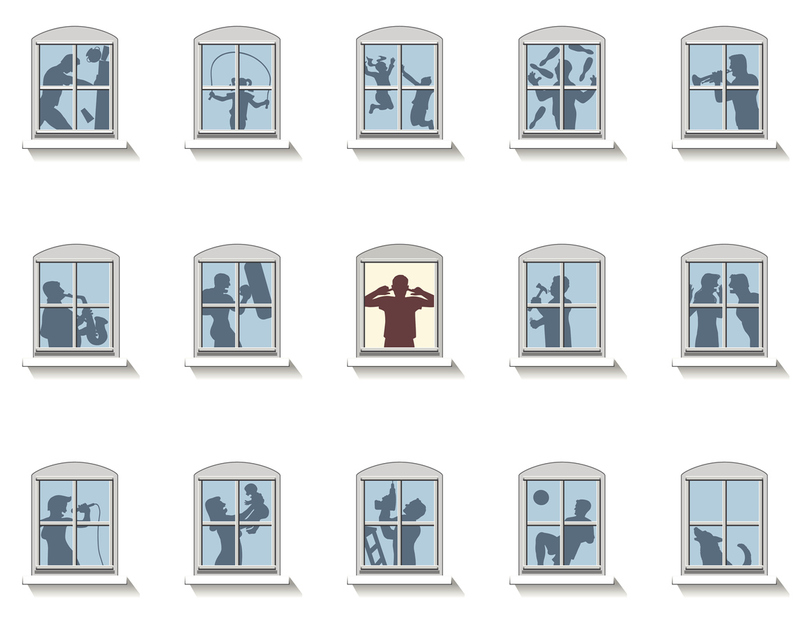 Several of the window series we offer incorporate noise reduction features to help people create the quiet home environment they crave. One of the many window manufacturers we partner with, Milgard Windows & Doors, offers the Quiet Line™ Series of windows specifically designed to reduce noise pollution. These triple-glazed windows utilize a specially optimized airspace that provides exceptional sound reduction results. Home products designed for noise reduction purposes are often rated with a Sound Transmission Class (STC). Quiet Line™ vinyl window can boast an STC rating up to 48, depending on the features you request. We also offer Ply Gem Simonton Windows & Doors, which provide great noise reduction performance results for customers. These windows feature an array of advanced noise insultation technologies designed to significantly reduce the intrusion of outside noises. You can listen to Simonton’s sound reduction performance in this short clip. Imagine being able to shut out whatever noise haunts your homelife, whether it’s a busy roadway, airport traffic or noisy neighbors, by simply sliding a window or door closed. Another one of our partners, Therma Tru® Doors, offers the Smooth-Star® series of entry doors, which are specially designed to significantly reduce noise pollution. These doors are available in a wide array of styles and can be modified with a variety of glass options so you don’t have to sacrifice aesthetic and style to enjoy a quieter home. Smooth-Star series doors have STC ratings of 36 and some can also be purchased with laminated glass in a standard Lip-lite frame for improved security. If you’re specifically seeking noise reduction performance, the last thing you want to do is invest a lot of money into replacement exterior and interior doors and windows only to be disappointed with the end result. That’s why it’s important to work with an experienced window and door replacement company that knows how to help you get the most out of your sound reducing window and door purchases. We offer vinyl, fiberglass and wood replacement windows from a number of respected manufacturers to ensure we can provide a comprehensive suite of effective solution to match and enhance whatever exterior style or aesthetic you’re pursuing for your home. The pros at Procraft can also assist homeowners with dissimilar glass, laminated glass and spacing of the glass to reduce noise at a reduced price. There are many solutions available for sound reduction, and we’d be happy to provide a number of potential options to help you get the quiet, peaceful home environment you seek. It’s always good to do your research before deciding on a home contractor. When you’re doing so, keep a close eye on their manufacturer partners and their capabilities. You’ll likely notice that many window replacement companies only offer one or two lines of windows. Most window replacement contractors are only qualified to replace specifically sized windows with no real capabilities to effectively adjust openings or craft custom-sized replacements. At Procraft, we employ Journeymen Carpenters who can perform structural modifications and even make new window openings, a service most of our competitors can’t offer. Some window replacement companies may try ineffective or short-term workarounds to make an improperly sized window fit where it’s not designed to, which is something we’ll never do. Whether your plans involve widening a particular opening or even walling in an existing window or door, Procraft can make the changes you want with seamless results that will appear to everyone as if your home had always been that way. We’re also one of the few companies who can rebuild “Old Construction” window openings to replicate window jambs and sills, even if they’re over a hundred years old. Of course, the best way to gauge a company’s reputation is by reading up on past customers’ experiences. We encourage you to visit our review page and learn about the results enjoyed by many Seattle area homeowners who are now living in a quieter home environment thanks to Procraft. Give us a call today at (206) 361-5121 or contact us online to schedule a free estimate and consultation!